The Valdes region is the number one destination for wildlife in Patagonia. From enormous southern right whales to clumsy penguins, from beaching orcas to waddling elephant seals, there are opportunities galore for up-close wildlife encounters. What can I see in Valdes? 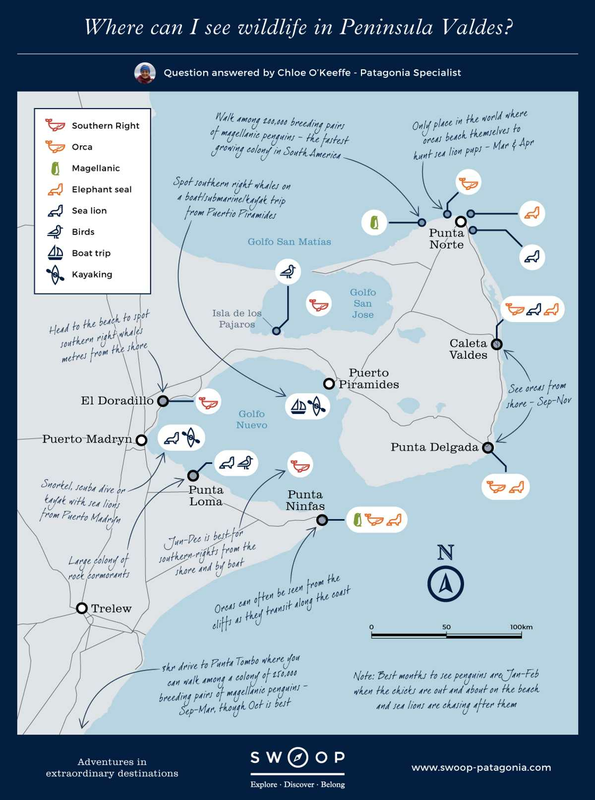 Where can I see wildlife in Peninsula Valdes? What wildlife can I see in Valdes? With over 1,100 individual whales counted in September 2016, the Valdes region is one of the most densely populated destinations in the world for whales, making it a very special place indeed both for conservation and encounters with the whales. Both orcas and southern right whales can be seen here, very close to the shore, allowing for incredible sightings by boat, plane, kayak and even onshore. There are seven different penguin colonies on the peninsula itself, the largest at Estancia San Lorenzo near Punta Norte (around 300,000 penguins), and the others at Punta Cantor in Caleta Valdes. Around 250km south of the peninsula is the most famous colony: Punta Tombo, with approx 400,000 resident penguins. They begin arriving by sea in September (males arrive first to rebuild their nests and await the females), and October is a month of fighting for female attention! The penguins raise their chicks here until April, when they head off to warmer climates for the winter. Magellanic penguins generally breed in burrows or under bushes, around 20 metres from the shore. They have a fish-based diet, and can be identified by the double black stripe under their chins. These hefty looking beasts of the ocean are actually pretty impressive swimmers, spending around 80% of their time in the water, and being able to dive up to 1,500m deep, for up to two hours at a time! They can be found on the shores of Valdes throughout the year, but are greatest in number from August to March. The big males will spend most of their time fighting each other for territory and females, which can take months. The best time for watching this is between September and October. By the end of March, the fights are over and there is less activity. From October to January the pups are most vulnerable, which offers the opportunity to spot orca attacks in some places. Punta Piramides has one of the largest reproductive colonies of sea lions in the Valdes area, with around 3,000 individuals present each season during the summer. Our favourite time of year to see them is between February and April when the pups are active; this is also the time when orcas can often be spotted hunting them at sea and from the beaches at Punta Norte. You can see them relaxing on land throughout the year, but to get up close and personal, there's no better way to befriend a sea lion colony than by snorkelling, scuba diving or kayaking with them. These excellent swimmers can dive as deep as 150 metres, and can hold their breath for around seven minutes. An adult male can weigh up to 300kg, reaching up to 2.3m long! There are a number of species of dolphin to be seen here all year round. Commerson's dolphins (black and white) are great to see in mid-November, when they have calves with them. The dusky or 'Fitzroy' dolphins travel in pods of 20–100 and are best seen along the coasts of Golfo Nuevo and Golfo San Jose. They are playful and will give you a great performance of pirouettes and somersaults! The Valdes Peninsula is home to a whole host of weird and wonderful land mammals. Scuttling armadillos, fluffy guanacos (relatives of the llama), skulking grey wolves, curious maras (oversized hare that exists only in Patagonia), snuffling skunks and tiny dwarf cavys (Brazilian guinea pigs) are some of the highlights. Sheep can be seen all over the peninsula too, although they are not native to the area. For the best chance of seeing land mammals, book a good guide to accompany you for at least one of your days in the area. Their expert knowledge and experience is invaluable, and they are incredible at spotting wildlife that you would never notice on your own. A range of birdlife (over 180 species) can be spotted in the region all year round, including imperial and royal cormorants, and the Darwin's rhea. One of the best places for birdwatching is Isla de los Pajaros in the south of the San Jose Gulf. There are also 66 migratory species, including the Antarctic pigeon. Other popular species are the Austral flamingos, choiques, great egrets, variable hawks and burrowing owls! For the chance to see as many species as possible, visit between September and December, when all of the above will be present. The best time for orcas is March and April, when they are hunting sea lion pups on the beaches of Punta Norte. Patagonia is a vast and varied region, with a wealth of things to see and do, a range of places to stay and a limited transport network. Why not let us do the hard work for you? Our team of experts will work with you to design a 2–3 week adventure to your exact requirements, from hiking and horse-riding trips to wine-tasting tours and undiscovered lodges. We’ll work around your budget and arrange flights, transfers and buses, to create your perfect trip.